In 1951, Eric Hoffer burst on the scene in 1951 with his irreplaceable tome, The True Believer, and assured his place among the most important thinkers of the twentieth century. Nine books later, Hoffer remains a vital figure with his cogent insights to the nature of mass movements and the essence of humankind. He was awarded the Presidential Medal of Freedom in 1983. 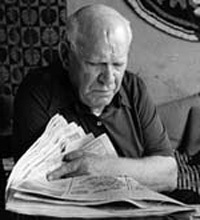 The Eric Hoffer Project was established to preserve the memory of the great American thinker Eric Hoffer through the publication and digitization of his works and the establishment of the annual Eric Hoffer Award for books and prose. Several projects are being researched and funded to make the Eric Hoffer papers, columns, and manuscripts available to the public. In addition, Hopewell Publications is currently restoring the philosopher's books to print and assisting their translation around the globe. In honor of the great American philsopher, The Eric Hoffer Book Award includes all book genres, awarding a grand prize, many category awards, and the winners of the Montaigne Medal, da Vinci Eye, and First Horizon Award.